To serve industries with a high demand for floor space, BSC offers of vertical carousel systems. These cost-effective automated storage and retrieval systems (AS/RS) maximize storage space while maintaining a minimal footprint and improving productivity. BSC’s key vertical carousel product is the Rotomat designed by Hänel. What is a Vertical Carousel? Vertical carousels are automated storage systems based on the same principle as a Ferris wheel. They use specialized software and a chain-driven carriage to rotate shelves up and down around a track to take requested items from storage and deliver them to an employee at an ergonomically situated access point. This mechanism allows for quick assembly, order picking, or packing. Vertical carousels put the available ceiling height to use, maximizing storage space while also increasing productivity. Vertical carousels have a standard controller that allows an employee to operate the system. 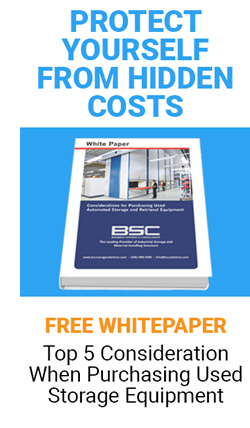 If a standalone carousel is not sufficient to meet a client’s storage needs, BSC can configure a vertical carousel to work with our vertical lift storage systems for even higher efficiency. For improved inventory management and organization, we also offer software that can integrate a vertical carousel within a client’s existing warehouse management system (WMS) or enterprise resource planning (ERP) application. The compact design of our vertical carousel systems allows them to provide substantial space savings compared to traditional shelving systems. 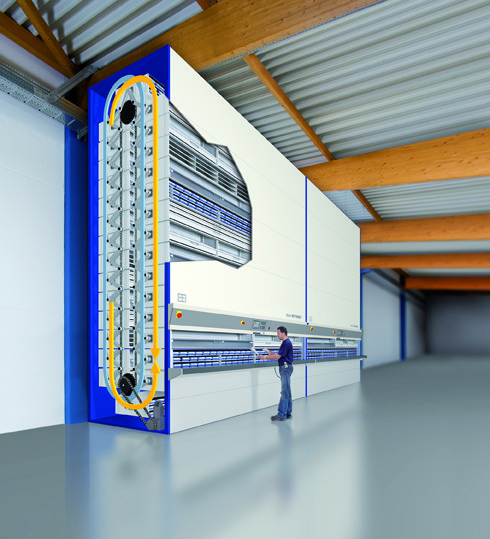 The footprint is small, but the increase in storage density achieved by using available room height allows vertical carousels to reduce the use of floor space by up to 75%. One vertical carousel can take the place of multiple rows of shelving, racks, or drawers, offering up to 60% more storage on the same footprint as conventional storage. Valuable floor space is freed up and can be put to other uses. Vertical carousels deliver items from storage directly to the operator, eliminating the need for employees to walk long distances to retrieve or stock items. Reaching, bending, pushing, climbing, and the use of ladders and lifts are minimized, reducing the likelihood of work-related injury through accidents or repetitive strain. As well, items are delivered to an optimum ergonomic height for retrieval by the employee, and controls are located in ergonomically correct positions. Vertical carousel systems are designed with operator health and safety in mind. Vertical carousels are suitable as storage units and can also be integrated into manufacturing as part of a workstation. They can be customized to fit the parameters of any space. 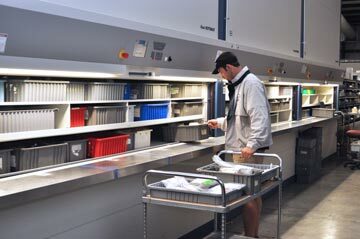 Shelves, also known as carriers, can be configured for customized storage using different types of partitions, inserts, and rollouts. Carriers can hold many kinds of drawers, bins, containers, pans, cases, totes, cartons, and other containers. Some carousel products offer dual-access options, allowing one employee to work at the front of the unit and one at the rear, or for employees to be on different floors. The possibilities are seemingly endless. Speed and accuracy are the defining features of vertical carousels, and implementation of one of these systems as part of a manufacturing, retail, or other enterprise ensures increased productivity. The delivery of items directly to the operator means that search time is no longer a factor, and the carousel retrieves selected items in seconds. Locating a carousel close to picking or production areas means that trips to stock areas and tool cribs can be eliminated, and transport of items between floors is no longer required. Implementation of a vertical carousel can result in significant savings in labor costs. Productivity improves with real-time inventory tracking, and the elimination of picking and order-fulfillment errors can result in an accuracy rating of up to 99.9%. We specialize in carousel storage for store spooled products (such as cable and wire) and rolled products (including vinyl, carpet, and textiles). We also offer specific solutions for tires, garments, paint cans, printing cylinders, hardware, and other items. Vertical carousels can be customized and adapted for numerous industries and products. BSC is proud to offer customized vertical carousel systems for storage, retail, and manufacturing applications. Please contact us to discuss your company’s specific requirements, and we will work with you to find an ideal solution. We guarantee careful installation and quick service for all of our vertical carousel products, ensuring operator safety, secure storage, and protection of factory warranties. We are pleased to partner with our clients at every stage, from design to installation to maintenance and check-ups.